There are places that change the very landscape of a community. Some do it culturally, while others do it with their mere physical presence. A few rare gems do both. In Orange Beach, Alabama, one such place is the Coastal Arts Center. At the very heart and center of this community, it celebrates life on the Gulf Coast in all its uncommon beauty. Housed until recently in the first hotel ever built in Orange Beach, the center is undergoing major change and revitalization. That beloved building was a boarding-style hotel built in 1923, accessible for many years only by water. The woman who owned it arrived to the coast from Ohio, after inheriting family land. She came down without her husband and built the hotel on her own. “There have been a lot of strong women involved in this property always,” says a strong woman in her own right, executive director Desiree Blackwell. Later the land would house a fishing camp, dotted with charming cottages that locals remember from the 60s and 70s. In 1974, new owners added a façade in the style of Natchez Trace architecture – this is the face of the structure the community came to know and love. The nonprofit organization Friends of the Arts operated the center for many years, with assistance from the City of Orange Beach. Yet when severe structural damage was discovered, the City took over full ownership and operations in 2013. The Coastal Arts Center will break ground on a new building in early 2016. All in all, there will be four buildings on the beautiful waterfront campus, including the hot shop, clay studio, a facility for adult and children’s classes and the gallery. Because the views from the grounds are so breathtaking, Blackwell says the center has always been a popular venue for weddings. Now, there will be a dedicated space for indoor receptions. Its location, directly adjacent to the waterfront park, makes the arts center a perfect destination for visiting families, who can roam acre upon acre to picnic, play and fish. The Hot Shop is the center’s public access glass studio, one of two of its kind in the state of Alabama. Here, there are classes every morning at 9 a.m. After a full demonstration by the artists in residence, participants can choose from several styles to make their own glass treasure, for a session fee of $75. (It will cool overnight, and you can pick it up the next morning.) Anyone can come watch the demonstration free of charge. You don’t pay unless you make a piece. There’s also a resident ceramics artists living and working here. The public can watch her work, or join in. 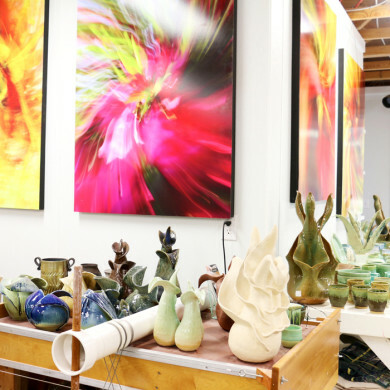 Fees differ depending on what you do – ranging from glazing pre-made pottery to throwing on the pottery wheel – from $20 flat to $65 per hour. In addition to monthly meet-and-greets, the Coastal Arts Center puts on several annual events. The springtime Festival of Art is held the second weekend of every March. For more than 40 years, the juried fine arts show has delighted visitors with two days of live music, gourmet cuisine (not your typical festival food), a children’s art alley and the works of 100 local and regional artists. The fall Scarecrow Festival is a fun, community event centered on a scarecrow building competition. There’s also a Hot Shop Blow Out every Christmas, featuring hot chocolate and special holiday demonstrations from resident glass blowers and ceramics artists. Blackwell says her small staff of seven are fully vested in this community. After all, they live and work right here. The Coastal Arts Center has become a social place, beloved by residents and tourists alike. Not only local people, either. As visitors go, Blackwell tells us her team tries to make everyone feel welcome and engaged and like family. Skip the beach for an afternoon, and check out a place that creates, inspires and celebrates beauty – both of its natural surroundings and all the artwork found within. The Coastal Arts Center is located at 26389 Canal Road in Orange Beach, Alabama. For more information, please visit the Coastal Arts Center website or call (251) 981-ARTS (2787).